It’s not always easy to sleep when you are on holiday, at least for the first few nights. The bed is different, the trip has you all excited, and the altitude of the mountain or the summer heat may make it difficult to fall asleep. But… how does it feel to sleep below sea level? If we exclude the unlikely event that a person descends from a lineage of mermaids or is wealthy enough to afford a bed in extravagant hotels under water, there are two ways to sleep below sea level that are both linked to specific occupations. Incessant noise, the smell of motor oil, the stench of sweat, heat, cramped spaces, uncomfortable cots shared with other people… Sleeping in a submarine is terribly difficult and only a few are able to live and work in such an environment. 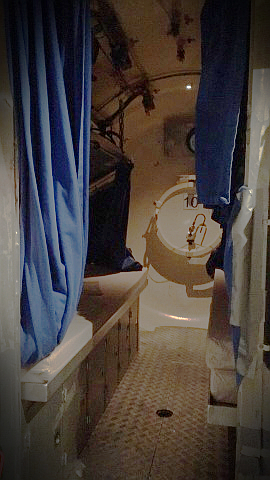 The lack of sunlight upsets one’s normal sleep/wake rhythm (which is reduced to 18-hour blocks) and the lack of oxygen (which is reduced to lower the risk of a fire) makes one feel incredibly tired…In other words, sleeping for submariners is indeed a nightmare! A sat-diver is a person who works deep underwater. Their job is to set-up the electrical cables or pipelines that connect islands, lands and continents. It’s always a sat-diver that is involved when someone has to retrieve archaeological artefacts on a seabed. It’s hard and risky work that involves spending rather long periods of time at great depths. At these depths, the risk of fire is very high, so much so that oil, sugar, baby powder and synthetic fabrics are strictly prohibited because they burn very easily. The pressure in these environments is also very high, which makes sleeping a massive effort that only a small number of real iron-men can manage to accomplish by keeping a stable and near-perfect mental and physical balance. Sleeping also involves other obstacles for sat-divers like excessive noise, movement and tension. The noise from the gas filtering system is loud, incessant and exhausting. The movement is intense, due to the ship rolling and the force of the waves. The continuous tension piles up (again, this is a very risky job, folks) because these professionals have to stay alert to deal with even the slightest noise which can mean a problem that needs to be dealt with quickly. For both of these occupations, having a comfortable mattress that is completely fireproof and able to regulate the body’s temperature can make all the difference, not only in terms of job performance but also for their quality of life. If you have trouble falling asleep during the first night of vacation, then think about those that are below sea level, where sleep is definitely much less pleasant. Try to close your eyes while you do that, you’ll surely feel more comfortable.